Our completely exclusive private bridal styling studio. After the success of the Wedding Industry National Award, plus several features in Vogue and Bride magazine, demand became more and more intense, and travelling across the UK and beyond got more and more vast. We decided to create a completely private bridal experience, exclusively for the use of some of our brides during their initial consultation trial. We designed and kitted out a bridal styling studio that really celebrated our unique style and reflected our love of the bridal world. Our future 2019 Deluxe Platinum Brides all have the option to either visit our intimate studio, where they can have the added bonus of the additional guidance and ideas of company owner, Phoebe Caramitsos. Phoebe still likes to be present for all studio based trials to offer her years of experience to the styling process with your stylist, so it’s advisable to come to the studio for a fully relaxing luxury bridal experience, where you’ll have access to more styling items like a veil and accessories. 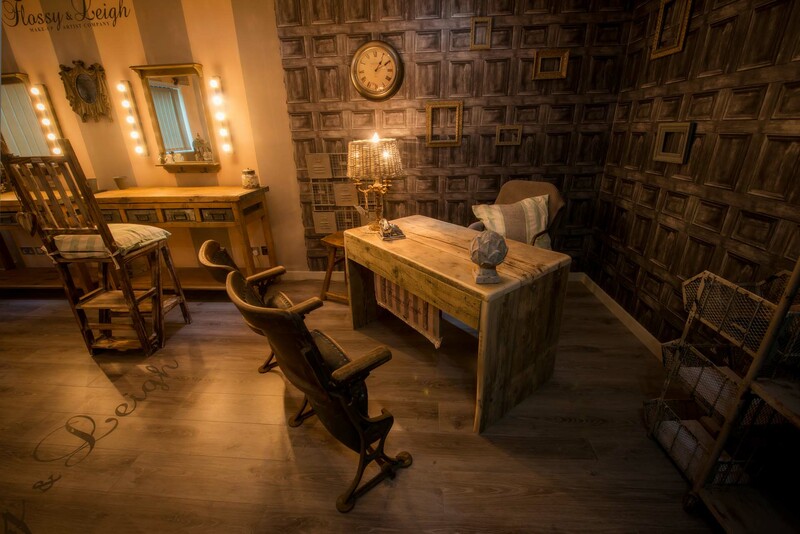 *Or you can opt for the the convenience of a home visit trial with your stylist, providing your trial address is within a 30mile radius of our base at BB112RD. Features include our beloved reclaimed antique Victorian theatre seats, where clients have their pre-consultation meeting where we go through wedding logistics for the morning, and discuss themes and ideas. One of our favourite features is our small collection of twinkling bespoke bridal accessories created by our friend Ann McKavney at the house of Eleventh Heaven, exclusively for Flossy and Leigh. We do not sell these pieces, but we use them to help mould the styling process, and advise you upon what sort of accessories your style will require. We also house a bridal veil to help this styling process as it reaches its finalé. "It's all about exclusivity and privacy"
Because we strive to provide each and every bride with a completely private and personal experience, we do not allow any other bridal parties in at the same time as each other. We look forward to seeing you there, soon.